(Jan. 11, 1945) -- Walter J. Antonik, 20, was killed Jan. 3 in the crash of a Liberator bomber on which he was a gunner and ordnanceman. He is the son of Mr. and Mrs. John Antonik of Ralph Street. The patrol bomber, VPB-105, serial No. 38947, was returning from an operational mission and had been diverted to Exeter Airport due to bad weather, including patches of rain, sleet and snow flurries at its home base at Fleet Air Wing 7, Dunkeswell Airfield. The pilot, Lt. George E. Pantano, had made contact with the field lights and asked for landing instructions. Upon starting turn to base leg, the plane, during a downwind landing at night struck 50 feet from the top of a 600-foot Beacon Hill, Sidmouth, near Honiton. The aircraft slid along for 175 yards before coming to a rest and burning. Killed were Pilot Pantano, Ensign M. W. Garber, Walter Antonik, Ammf3c G. A. Matta, Sea1c A. R. Pelath, and Amm3c A. E. Simmons. Crew members who escaped with minor injuries were Ensign Walter T. Wilson, Amm1c Joseph C. Juhasz, Arm3c Clarke R. Willey, Jr., and Arm3c Dean G. Ludlow. The U.S. Navy and U.S. Army Air Force operated from Dunkeswell Airfield, England, during WWII, protecting the convoys and keeping open the vital sea lanes from America to Great Britain. Walter Antonik graduated from Belleville High School in 1942. He entered the Navy in Jan. 29, 1943. He received his boot training at Sampson and his radar/gunner training at Memphis, Tenn., Jacksonville, Fla., Chincoteague, Va., and Boca Chica, Fla.
Antonik went overseas in October. 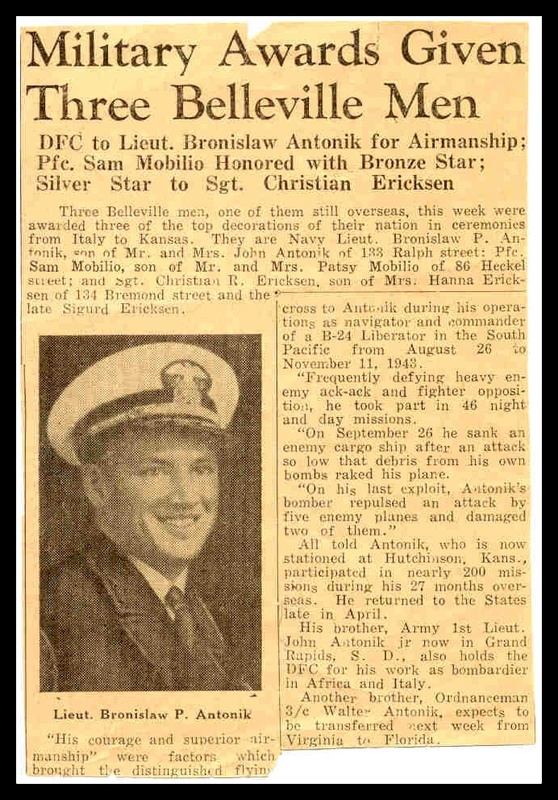 He is also survived by his brothers John C. Antonik and Bronislaw P. Antonik, both presently in service. 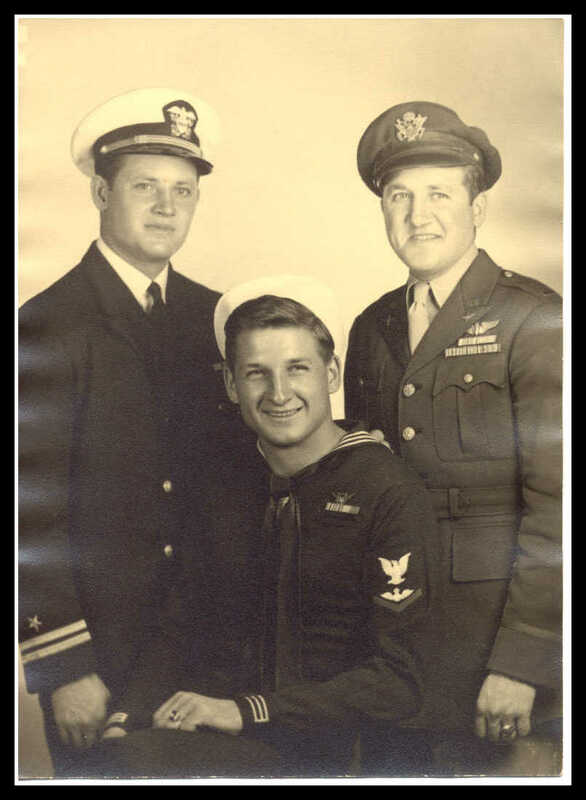 Antonik brothers, from left, Bronislaw P., Walter Joseph and John Jr.
(March 23, 1944) -- Aviation ordnanceman 3/c Walter Antonik, son of Mrs. and Mrs. John Antonik of Ralph Street, reported this week to Chincoteague, Va., for further training. Antonik wears the American Theatre campaign bar, and submarine patrol ribbon, and member of combat air crew. (Aug. 2, 1945) -- A memorial was dedicated by Fleet Air Wing Seven and contained the names of 182 other U.S. Navy men who lost their lives while operating from the Air Station. The memorial is located at the U.S. Naval Air Facility at Dunkeswell, England. The site is five miles inland from the English Channel, near Exeter, Devon. It is the only U.S. Naval Air Station in England. A memorial organ in Kuneswell Parish Church has the names of the men on a bronze tablet.